This was a good twist. I enjoyed reading this. It was a little hard for me to get into it at first but then I was all in. The only thing that bugs me is all the “F” bombs. I just never heard it as much as I read it. Samantha is a good soul herself. She keeps Jax grounded. He has always loved her and she has always loved him. But Jax up and left one night and Sam never understood why he left. Then Jax came back because his uncle who raised Jax and his twin, Chase was dying. Samantha had tried to move on and went to school but when she was attacked on campus she came home. Chase was also home when Jax came home. 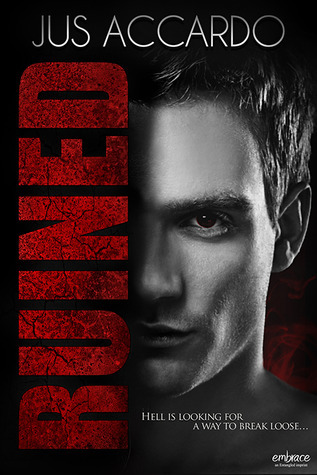 Jax’s demon in him despises Chase and has wanted Chase dead. Jax has fought his literal inner demon on it for years until one night when he is over Chase with a knife in his hand and decides he needs to leave to protect his family. You see, this demon in Jax needs to feed off fear, lust or any severe emotion or violence. And Jax is too afraid of letting it hurt Samantha either so he leaves without so much as a goodbye or note. When Jax sees them both, he wants to leave but stays when he finds out Samantha is in danger. Then after being back and the sparks are still there between them, his demon decides he likes Sam too. Then Jax learns of the rules of the demons when he comes back and has to fight for his life and Sam’s too. Then all hell breaks loose as things get more complicated and Jax finds out who is inner demon really is and what he is. Now, he is running out of time to find out what demon has literal control over Sam. And then he has to figure out how to fix it. And with intimacy being a problem ,due to the demon’s need for strong emotion and violence, things get more complicated and creative. But Sam will wait for Jax because even when she finds out about Jax, she is still there for him and believes in him. There are many deals made by the end of the book and it is both happy and sad. I want the next book NOW . I may lose it soon and find my inner demon; because Sam and Jax still need each other and I need to see that! I kind of knew where some of this was going but I didn’t guess it all. Now, I have more questions than answers. But, Jax, he is definitely swoon worthy material! If you like, demons, good vs. evil, wars, super strength, someone else getting the injuries and not you, because you have that kind of power, and fighting for what you want and overcoming what you are then you will like this. 4.5 stars for I am getting tired of lots of F bombs in books! ...I'd watched the girl with the long brown hair stand eerily still. She didn't cry. Didn't speak. Only stood there staring at the ground as her parents were lowered into the cold, wet earth. Even then, so early in my life, I saw pieces of myself mirrored in her eyes. Lost. Alone. Separated. Ruined. It was another one of those defining moments. I'd known, even then, that this girl would play a monumental role in my life. We'd grown up close. Inseparable, really. Friends. Partners in crime. It was the last step-love-that pushed me to leave her behind.